Now its time to introduce Samsung Galaxy-A series new smartphone Samsung Galaxy A50. The midrange price smartphone comes to a lot of new features and innovation from it’s previous released Samsung Galaxy A9 2019. It’s Infinity-U notch full view display make it larger, big size battery life and In-display fingerprint sensor make it more impressive. Nowadays some people love to a big size display phone as Samsung Galaxy A50 has. It comes with 6.4-inch Super AMOLED big size display. It will provide a better viewing experience than before. Its 1080 pixels by 2340 pixels HD+ resolution 403 PPI density make picture and videos more alive. For glass protection, Samsung uses Corning Gorilla Glass 3. 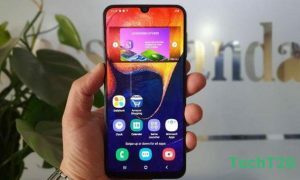 Samsung Galaxy A50 runs on Android Pie 9.0 OS and powered by Samsung own innovation Exynos 9610 Octa chipset. Its 2.3 GHz Cortex-A73 & 1.7GHz Cortex-A53 Octa-core processor make it fast and smooth. For high-resolution gaming experience Samsung provide the latest Mali-G72 MP3 Graphics Processor Unit. Inside the hood, Samsung Galaxy A50 has 4/5 GB of RAM and 64/128 GB native storage. So you can choose your capacity wise RAM and internal storage. If you need more storage you can expand it up to 512 GB via dedicated microSD card. Now come to its camera features. Samsung Galaxy A50 has triple rear and one single front-facing camera. These are 25Mp with f/1.7 aperture, 8MP ultrawide angle with aperture f/2.2 and 5MP depth sensor with aperture f/2.2 and 25MP single selfie shooter. So serious mobile photographer this device will be a great part of your mobile photography. Samsung Galaxy A50 price in Bangladesh is BDT 26,990. This mid-range price device also provides you some extra features like In-Display fingerprint sensor, fast battery charging, Type-C reversible connector and many more.